It’s very common for freshmen to go back to their hometowns for summer after finishing their first year of college. 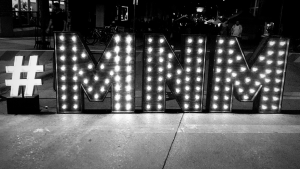 I will be the first person to tell you to reconsider, because there is one event that is exclusive to a Madison, WI summer that you just aren’t going to want to miss out on, and that is the Madison Night Market (MNM). Once a month for four months only (May, June, August, and September) the streets of downtown Madison are flooded with local vendors and live music. Vendors sell anything from homemade soaps to bakery goods, jewelry, and food from 20+ carts. The market spans from the top of State St. (by the Capitol) to the bottom (near Bascom Hill), with most of its vendors selling right in between on Gilman and State. I had the most magical time visiting the MNM myself on May 10. I was greeted by the sound of lively jazz music, which much to my discovery, was a full band playing in Peace Park. I took my time walking down the streets, making sure to stop by each vendor so that I could take in the full night market experience. The vendors’ tents were lit with strings of bulbs, drawing in the local Madison crowd like moths to a porch light. There were photo opportunities at every corner, it was hard to resist when everything was so picturesque! Now, after hearing about one of the coolest and most unique experiences Madison summer life has to offer, are you really sure you want to go home for summer?